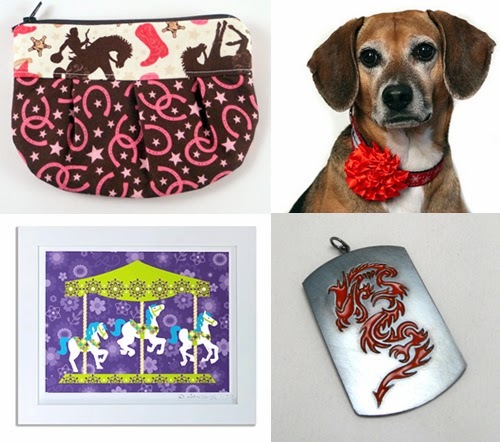 Boston Handmade: Monday Mosaic: Happy Chinese New Year of the Horse! Monday Mosaic: Happy Chinese New Year of the Horse! The horse is part of a 12-year-cycle of animals that make up the Chinese zodiac. These interact with the five elements: wood, metal, fire, water, earth. 2014 is the year of the wood horse, taking over from the year of the water snake. It will be a fast year full of conflicts according to some astrologers, who see wood as providing fuel for the energetic horse sign. The later part of the year is “yin fire”, increasing the potential for heated clashes even more. The upcoming Horse year is a 'yang wood' year, when people will stick more to their principles and stand firm. Negotiations and compromises are difficult, as people tend to fight for their ideals.